COMEDK 2019 Application Form (Released) | COMEDK Login Last Date is 19th April. Check COMEDK 2019 Registration Process, Exam Dates, Eligibility. COMEDK 2019 Notification: COMEDK 2019 application will begin from January 16, 2019 and end on April 19, 2019. COMEDK 2019 Registration has already started. COMEDK Application Form Correction can be done be done between April 20, 2019, to April 22, 2019. Candidates attempting the exam can download COMEDK Hall ticket from May 03rd, 2019 to May 11th, 2019. COMEDK 2019 exam will be conducted on May 12th, 2019. Now that the exam date is out, you should start with your preparation right away. It is expected that COMEDK will also regulate the admission procedure for architecture course on the basis of candidates NATA score. The Consortium of Medical, Engineering and Dental Colleges of Karnataka (COMEDK) is an entrance exam for various medical and engineering courses. As COMEDK UGET is a state level examination, candidates need to work really hard to get admission in their desired engineering or medical courses. The candidate should have passed 2nd PUC or 10+2 Higher Secondary or an equivalent exam. The aspirant should have qualified 2nd PUC or 10+2 Higher Secondary or an equivalent exam with Mathematics. The candidate should have passed the above-mentioned exams with PCM and English as a compulsory subject. Candidates can also be a qualifier of 10+3 Diploma examination as well. He should have qualified the above exams with a minimum of 45% marks (for General) and 40% marks (for SC/ST/OBC category of Karnataka state). Also, he/she should have passed the Physics, Chemistry and Mathematics separately. Physics and Mathematics are compulsory subjects while there is an option between Chemistry or Bio-Technology or Biology or Electronics or Computer Science. He should have passed the above-mentioned exam with at least 50% marks (45% marks for SC/ST/OBC category of Karnataka state). In addition to this, the candidate should have qualified NATA or an equivalent exam. Diploma Candidates are not eligible for COMEDK UGET Exam. There is no exam for candidates who are applying for B. Arch course. They need to submit a separate application form for participation in the counselling. Step 2 Click on “Engineering Application”. Step 3 After that click on “Login or Register” button. Step 4 You will be asked to enter the Application SEQ Number/User ID and Password. But since you have not registered. You need to click on the “Click here for Registration”. Step 5 Fill in the required details like “Full Name”, “DOB”, “Unique Photo ID Proof”, “Photo ID Proof Number”, “Email ID” and “Mobile Number”. Step 7 After that you need to enter the captcha code and then an OTP will be sent to the mobile number that you have provided. Step 8 A new window having your previously entered registration details will open where you need to enter the OTP. Step 9 Re-check all the details, enter the captcha code and click on the “Register” button. Step 10 After that a page will appear where you will be having the User ID and all the details that you entered. Also, you will be notified that you have successfully registered yourself and a User ID and Password will be sent to your mobile number and email ID. Check the below-mentioned guidelines to fill COMEDK Application Form after COMEDK Login. Step 2 You will be shown that your application form is incomplete. So you need to go to the topmost right corner and click on the “Go to application” tab. Step 9 Enter your “Payment Mode” and “Amount”. The COMEDK 2019 exam is fully computer-based. The test will be made available to the candidates only in English. There is no negative marking for wrong attempts. The COMEDK 2019 Admit Card will be released on May 03rd, 2019 and will be accessible to download till May 11th, 2019. 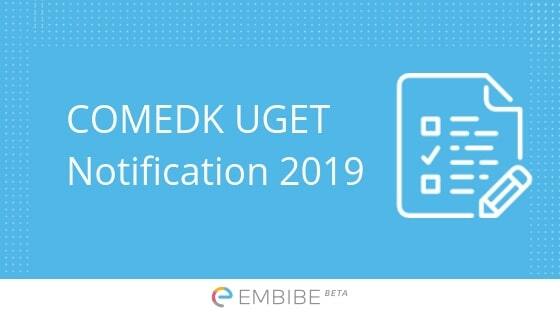 The Admit Card also called the Online Test Admission Ticket (TAT) can be downloaded from the official website of COMEDK UGET within a specified date. Candidates are required to preserve the Admit Card until the end of the admission process. COMEDK UGET TAT will be available online and it will not be sent to the candidates through courier, post, email or in person. Now that Embibe has provided you with all the important information on COMEDK 2019 Notification, we really hope for your great victory in the examination ahead. Start your preparation for COMEDK 2019 UGET exam right away to avoid any last minute confusion. Finish the COMEDK syllabus and solve as many COMEDK practice questions as possible. Also, lend your time to practising as many JEE Main Mock Tests as you can because taking JEE Main Mock Tests will prepare you for all the other entrance exams owing to the similar difficulty level and exam pattern of real exam. You can also take the COMEDK Mock Test on the official website of COMEDK to enhance your preparation level. If you have any confusion regarding the COMEDK 2019 Notification, you can always drop down your queries in the comment section below and we will get back to you.